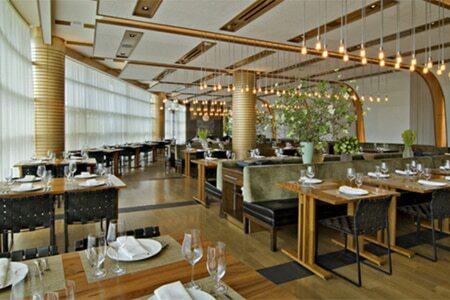 An outpost of Tom Colicchio's Manhattan original in Century City. : Tom Colicchio's Los Angeles branch of Craft occupies its own one-story building off Constellation Boulevard, surrounded by Century City's high-rises but also by a four-acre park. This neighboring open space brings light into the dining room through floor-to-ceiling windows and makes the terrace, where meals are also served, a pleasant green retreat. 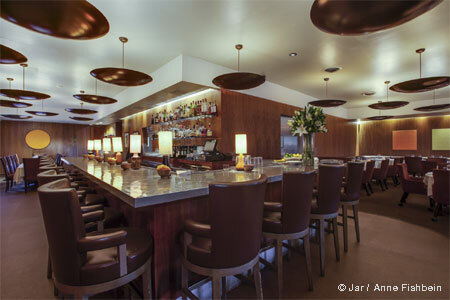 The elegant interior is done in gold and beige tones, with a large bar area as you enter. Decorative elements include the lighting fixtures suspended from the ceiling and pillars covered with gold mosaic. If you can, reserve a booth. They are spacious, comfortable, and the noise level is minimized (though excessive noise is not really a factor). John Keenan, longtime Craft sous chef, now oversees the kitchen. Diners can start with charcuterie, salads (baby beet and Gorgonzola), pasta (rabbit pappardelle and roasted tomato), and fish or shellfish served raw (hamachi, oysters) or roasted (Peruvian octopus with Greek yogurt). Main dishes might include braised beef short rib with root vegetables, and roasted Hawaiian blue prawns with cucumber vinaigrette. All sides are made with fresh vegetables (flowering squash, assorted mushrooms). For dessert, try the chocolate soufflé or plum and raspberry cobbler. Lots of attention has been given to the wine list, which has a heavy emphasis on California and French labels. Craft cocktails include house-made ingredients like blood orange jam, hibiscus flower syrup and Velvet Falernum.